The view is miles of blue ocean, the sunlight playing across its gentle ripples. Below me is a verdant valley that stretches all the way to the crescent of sand marking one of the island’s most popular beaches, Chaweng. It’s calm and tranquil here and the penthouse I’m standing in definitely has the “wow factor”. It has an L-shaped lounge and coastal colours of blue, white and gold. It’s one the best-value rentals I’ve seen on my scouting trip on Koh Samui, costing just $1,040 a month for long-term rental. It comes fully furnished and it’s 130 square metres, with two bedrooms and one bathroom. You have a shared swimming pool and there’s a restaurant in the complex, too. Plus, you’re just a 10-minute drive from bustling Chaweng town. I’m on Koh Samui, Thailand’s second largest island (after Phuket) and home to white-sand beaches, a happening international dining scene and excellent healthcare. Yet despite getting around 1 million visitors a year, the island’s size means it’s relatively easy to escape the crowds. Year-round temperatures average between 25 C and 30 C and a large and active expat community means making friends is easy and the cost of living means you’ll get great value. You can have a comfortable lifestyle here for around $2,800 a month, including rent. That’s exactly what I found in Mae Nam, a peaceful spot about 20 minutes’ drive west of the airport. The quieter, more laidback environment is attractive to expats, plus it’s cheaper to rent around here. For for $670 a month you can make yourself at home in a brand new two-bedroom, one-bathroom furnished villa set in landscaped gardens. 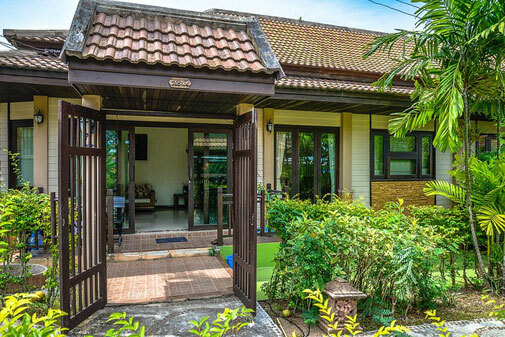 It’s just a five-minute drive to the world-class Santiburi Golf Course, local markets, restaurants and Mae Nam beach. Though not overly large at 69 square metres, I see these modern villas as an ideal entry-point rental in a preferred area of the island. Bophut, home to a picturesque three-kilometre beach and old teak shophouse-lined streets oozing traditional Thai character, is one my favourite places on Koh Samui. The Fisherman’s Wharf complex offers boutique shops, a broad choice of cafés, bars and casual restaurants and just a 10-minute walk from here I checked out a fully furnished two-bedroom, two-bathroom villa. Featuring a Western-style kitchen, a small terrace and gated garden, it’s available for rent at $965 a month. The complex is about 10 years old and has two swimming pools, a steam and sauna room, parking and 24-hour security. The property is also listed for sale at $150,000 and with some new furnishings and minor renovation would make a very comfortable, no-fuss home for a couple. 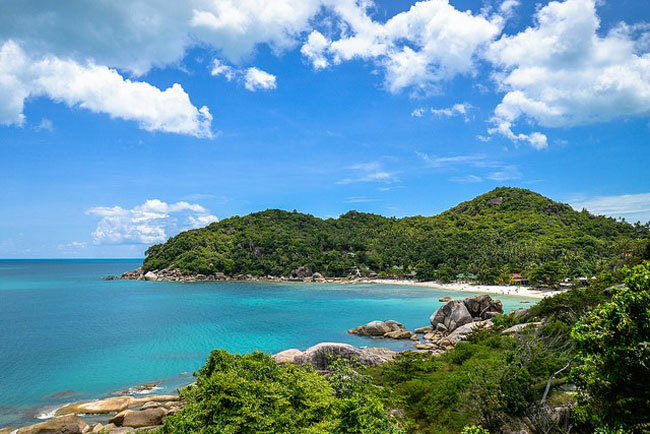 Buying property in Thailand comes with certain restrictions but many expats have happily bought homes around Samui. You’ll find a vast range and a lot of good value, too. In the Bangrak area, a one-bedroom, 34-square metre apartment in a complex featuring a large swimming pool, bar, restaurant, tennis court and fitness centre, is currently on offer for $105,800. In a safe and secluded part of Chaweng Noi, I was impressed by an exclusive project of nine sea-view villas. It’s a unique setting, with a giant white Buddha statue sitting atop the hillside, providing a peaceful tropical ambience—perfect for couples and with plenty of surrounding green space.